Apple Crumb Cake - simply & healthy vegan recipes that taste amazing! 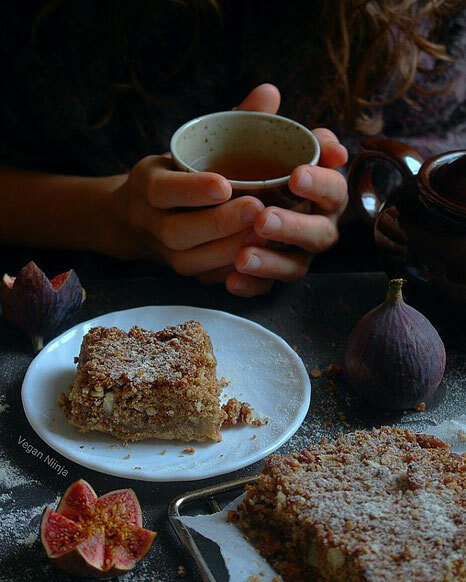 It´s autumn time and we all need some comform food and cakes to keep us warm and enjoy those cold days. it will make you addited and you will end up making this cake every day;)! Healthy Apple Crump Cake. This cake is gluten free, vegan and refined sugar free. This cake is perfect for cold autumn days with some hot tea. Start with the apple/pear filling. Chop the fruits in small pieces and add all the ingredients for the filling in a small pan. Let it boil for about 15-20 minutes, until the fruits are soft. Add some more water (1/2 cup) if it´s not juicy enough. You should have some liquid with the fruits. Set aside. Mix the ground almonds for the crumble with 3 tbsp of the fruit filling cinnamon-liquid and set aside. Mix all the dry ingredients for the base in a large bowl or in a food processor. Than add the coconut oil (not melted coconuit oil). You can use your hands to mix the coconut oil with the dry ingdredients. Be sure it sticks together very well. Put 1/3 of the dough aside. Press out the dough for the base over a parchment paper. (20x15 cm). You can use a small pan or a cake mold for this. Spread the apple/pear filling and 2-3 tbsp of the cinnamon liquid over the base. Prepare the crumble. Mix the ground nuts and 3 tbsp of the liquid from the boiled fruits and the batter that you have set aside (step 4) together. Be sure it sticks together and add some maple syrup or rice syrup if its doesn´t. Spread the crumble mixture over the filling and press it down carefully to make the surface evenly. Heat the oven to 180 C and bake the cake for 25-30 minutes or until golden brown! Serve warm! Enjoy with good company and some tea! If you try it out or have any question, leave a comment below!